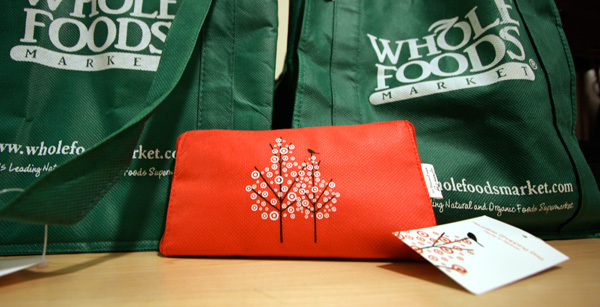 Target is now implementing a incentive program every time you use the reusable bag. Smart in these trying times and a beautifully designed bag to boot! 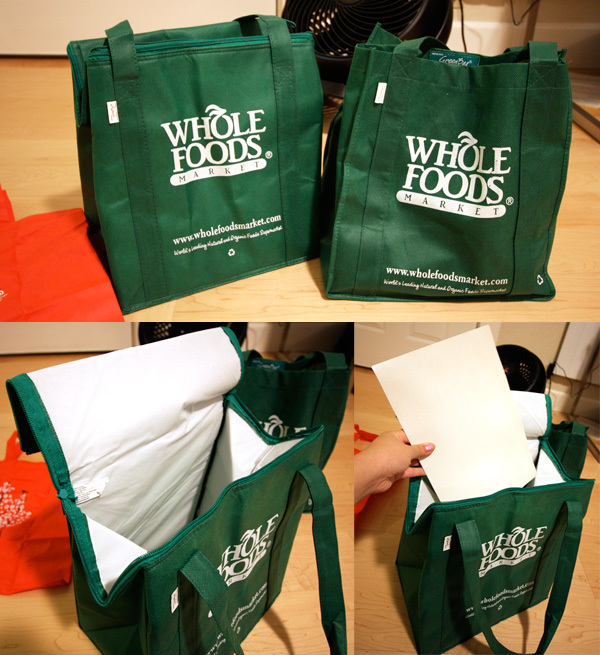 Hey: the idea of buying a reusable bag and having it, and everything else thrown into plastic bags is a common one. I have finally (I think) gotten it spread far and wide enough that I’m allergic to plastic bags. I think about 20-25% of the checkers and bag people believe me, and they all think that the cloth bags I make are great looking, but they all still prefer the plastic bags. (I presume to save time…or something: it isn’t to save the planet or the rivers or the roadsides!) I’ve not seen any like the ones that you’ve shown. It looks neat though. I think I can make something like that. 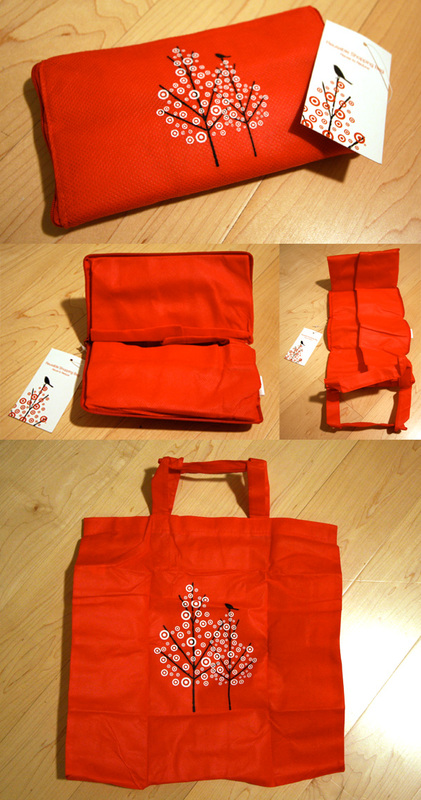 You can buy the Target bag online over at the Target Bullseye Shop . I think it’s great that the inexpensive bags that stores offer makes the whole reusable idea accessible to more people, but those mass-produced polyprypolene bags are neither eco-friendly or well-made. I started a company called minusbags (www.minusbags.com) because I wanted to have well-crafted, cotton bags made in the U.S. The sewers that make my bags take great care with their work and it shows. And I don’t think $16 is an outrageous amount for a washable bag that will last a very long time. I am curious to know if more people are willing to pay more for organic cotton. It’s something I struggled with — better to have it be cheaper to get more users? or keep it as green as possible? Any thoughts? A few years ago Trader Joe’s sold canvas bags that have been completely fantastic. They had regular sized bags for about $2.99 and large canvas bags like the LLBean or Lands End bags for just $6.99. They’ve held up great and I just keep them in the car for all my shopping. I bought several of each. I looked at the current model at Trader Joe’s, and I am less than impressed. I bought five Green Bags thru ecobags.com about six months ago and had problems right off the bat. Two out of the five arrived with unsewn seams and then less than a month later two more developed holes in the seams due to poor stitching and cheap thread. 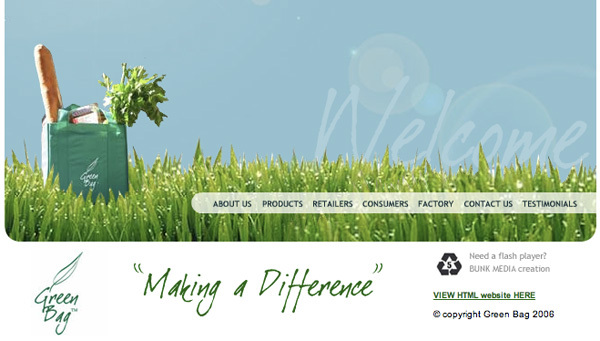 Thankfully the customer service at ecobags was outstanding and they refunded my money without me having to ask for it. They’re great bags, if they’re sewn properly. I’ve also purchased bags at Walgreens, CVS and Rite Aid. Rite Aid was the only shop that put my bag inside a plastic bag. The cashier obviously had no clue what the bags were meant for.